I am a big fan of Cabot products. Cabot Creamery is a co-op made up of dairy farms. Co-ops are owned and operated by their members, so basically the dairy farmers and their families own Cabot. Their butter, sour cream and cheese are staples in my fridge. When Cabot contacted me asking if I would be willing to sample their light cheese, I jumped at the chance. For the record, I am not a Cabot employee and am not being compensated by them – apart from the samples they sent. I also need to let you know that I am not a fan of anything that’s light, low-fat, no fat, no sugar – well, you get the picture. So when Cabot asked if I would sample some of their light products, I kept an open mind. After all, I love their other products so how bad could this be? We received two 8 oz. blocks of cheese – Pepper Jack light and the 50% reduced fat, sharp cheddar. We sampled the cheese three ways – 1) sliced with crackers, 2) melted on bread, and 3) in mac and cheese. We tried the Pepper Jack first. We all agreed that the taste was great but the texture was a little rubbery. We then moved on to the cheddar. Much better consistency and really good flavor. For good measure, we compared it with Cabot’s Seriously Sharp (because we always have it in the fridge!) and to make sure we were doing as close to an apples to apples comparison as possible. Conclusion: If serving with crackers, fruit or just to snack on, I would recommend it. One of our favorite snacks is cheese toast. So a sampling of light cheese wouldn’t be complete without melting it on some Tuscan bread. Again, the flavor was great and both cheeses melted really well as you can see below. The mouth feel was a wee bit ‘plasticky’ but if you’re doing the low-cal thing, this can be easily overlooked. In our opinion, flavor and meltiness (is that a word? ), trump the slightly different texture. Conclusion: Grilled cheese lovers will definitely not feel like they are sacrificing anything when grilling with this cheese. Pictured in the foreground is the Pepper Jack Light – super melty! The last time I made mac-n-cheese, I used Cabot’s Seriously Sharp and Jalapeno cheese. I decided to use my recipe and replace it with the reduced fat version of both cheeses. The recipe calls for making a white sauce and adding shredded cheese. The sauce tasted great but it just didn’t melt right after baking with the macaroni. Weird. I can only attribute it to their not being enough ‘fat’ in the cheese. Conclusion: I would not recommend using low or reduced fat for dishes like mac-n-cheese or a gratin. I am still a fan of any dairy product that’s not reduced or low fat – especially Cabot products. That being said, I would definitely snack on the low fat cheese and use it for melting but maybe not so much in a sauce. Thanks so much, Kim! We really appreciate your taking the time to cook and review our Light Cheddars. And I LOVE your photo. That looks so good! Can I pin it to our Pinterest board? My pleasure. I really love your products. Feel free to Pin away! We used the 50% light cheddar in a recipe last night and it did well–perhaps because it was melted with milk on the stove top and then used in a Broccoli Casserole? Not sure why it worked but so glad it did! I dig their pepperjack and sharper flavored cheddars. 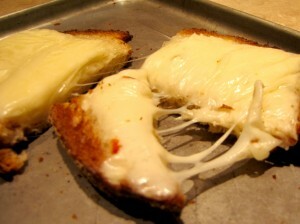 Melted on toast (or any form of melty cheese) is a major weakness for me! Thanks for your thorough review and your excellent explanation of Cabot’s cooperative ownership. Our farm families really appreciate your support!